Chernobyl Children's Project International Photos, links, videos, blogs, how to help. Chernobyl Exclusion Zone Nature of polluted territory (photos, videos). ^ Davies, Norman. Europe: A History. Oxford University Press. 1996. ISBN 0-19-820171-0. ^ Inside Chernobyl. National Geographic Magazine. [2017-12-28]. 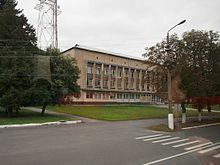 ^ THE OTHER REPORT ON CHERNOBYL (TORCH). [2010-04-26]. ^ Folks near Chernobyl still cloudy about health. [2007-11-23].